#81012/w01 - black US 101 headwrap (doo-rag). 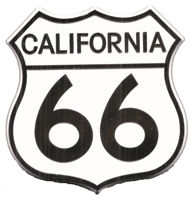 0475-2266C - MISSOURI ROUTE 66 hat pin. Pin is .875" hat pin with rubber clasp. It is packaged on a card in a bag. sPM9/3X - lifeguard straw hat with chin cord. Size 3X. I think we are the only company with a 3X straw hat! 6" crown, 4.75" brim. 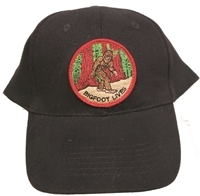 x121825x17401 - BIGFOOT LIVES black cotton low profile cap. Hook & Loop belt adjust. 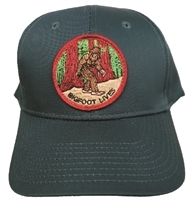 x121825x17450 - BIGFOOT LIVES dark green cotton low profile cap. Hook & Loop belt adjust. 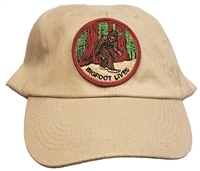 x121825x17460 - BIGFOOT LIVES cotton low profile cap. Hook & Loop belt adjust. 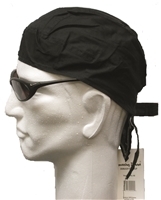 w-01 - black cotton headwrap (doo-rag, du-rag, durag, kerchief). 1 size fits many or most. Black felt pinch front hat. 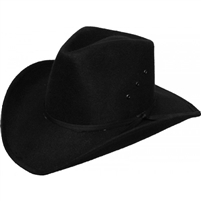 hSP163P - Black felt pinch front hat. The brim is 3.5". The crown is 4". Sizes: Kids, Sm, Med, and Lg. hFB001-KHAKI - Bush or jungle style hat with neck flap. It is firm but flexible 65% cotton & 35% nelon. It will fold sideways for travel. It is sized Small, Medium, Large, or Extra Large. CALIFORNIA REPUBLIC flag embroidered patch: metallic gold on black - 2" x 3.25" - Patches sew or iron-on and are carded to hang on a display rack for stores. 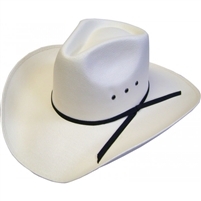 hCAN-235-e - Canvas pinch front hat. The brim is 3.5". The crown is 4". Sizes: Kids, Sm, Med, and Lg. 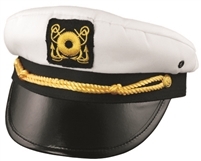 hW11618000 - captain's or yacht cap. Cotton. One size fits most. 0120 - 100% cotton corduroy cap. Black, Maroon, and White have hook & loop belt adjust to fit most people. Other colors (Light Blue, Navy Blue, Royal Blue, Brown, Light Brown, Red which has a tinge of pink or cherry in it, & Light Khaki) have a plastic tab adjust. Black and White are five panel caps with a braid over the visor. All others are 6 panel pro-style. 0-0923 - GEEK embroidered patch. This has been commonly available only on Interstellar Propeller beanies. It now is available as a patch (or we can sew it onto an Interstellar Propeller beanie). 2" tall x 3" wide. Patches sew or iron-on & are carded for retailers to hang on a display. 0-0921 - HACKER embroidered patch.This has been commonly available only on Interstellar Propeller beanies. It now is available as a patch (or we can sew it onto an Interstellar Propeller beanie). 2" tall x 3" wide. 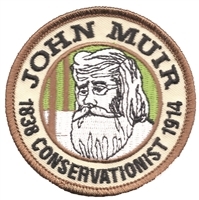 Patches sew or iron-on & are carded for retailers to hang on a display. HISTORIC US 66 bush hat with a back flap to protect the back of the neck. x6878xhFB00160 - HISTORIC US 66 bush or jungle style hat with a back flap to protect the back of the neck. It is firm but flexible 65% cotton & 35% nelon. It will fold sideways for travel. It is sized Small, Medium, Large, or Extra Large. You can order by the size. 0475-6878 - HISTORIC US 66 hat pin with plastic clasp (clutch). .875". Epoxy coated printed pin. Individually poly bagged or carded for a retail store display rack (+$.10). hW21872000M - hooded acrylic scarf. Black or Brown. 0-0475-I-RODE-ROUTC - I RODE ROUTE 66 hat pin. .875". Rubber clutch. Poly bagged and carded for stores. ILLINOIS ROUTE 66 hat pin. Pin is .875" with a rubber clasp. It is packaged on a card in a bag. 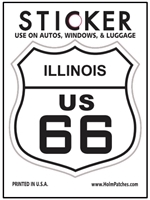 0475-1666C - ILLINOIS ROUTE 66 hat pin. Pin is .875" hat pin with rubber clasp. It is packaged on a card in a bag. 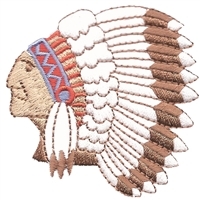 7210 - Indian head embroidered patch - 2.375" wide x 2.375" tall. Patches have an iron-on backing & are carded for a display rack for retailers. KANSAS ROUTE 66 hat pin. Pin is .875" hat pin with rubber clasp. It is packaged on a card in a bag. 0475-1866C - KANSAS ROUTE 66 hat pin. Pin is .875" hat pin with rubber clasp. It is packaged on a card in a bag. x810232x18901 - LIVE TO RIDE, RIDE US 101 black knit beanie made in USA. This is bulkier, larger, & heavier than our standard #182 knit beanie. © Bill Riley, Rusty Bolt, and Holm Patches. 2205 - MISSISSIPPI medium flag shield embroidered patch. 2.5" wide x 2.75" tall - Patches sew or iron-on and are carded for a retail display for stores. 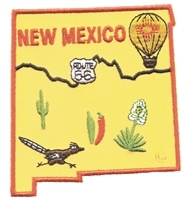 2571 - NEW MEXICO map souvenir embroidered patch. 3 3/16" tall x 2 .875" wide. 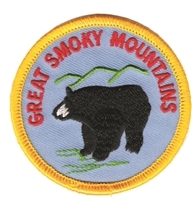 Patches sew or iron-on and are carded for a retail store display for stores. © Holm Patches 7/2018. OKLAHOMA ROUTE 66 hat pin. Pin is .875" hat pin with rubber clasp. It is packaged on a card in a bag. 0475-2816C - OKLAHOMA ROUTE 66 hat pin. Pin is .875" hat pin with rubber clasp. It is packaged on a card in a bag. 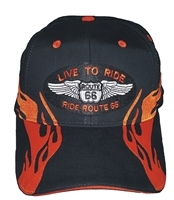 #66LIVE32/1303201 - Orange side flame Route 66 brushed cotton black cap. Hook and Loop belt. One Size Fits Most adjust. 7441 - Peace sign embroidered patch. 1". Sew or iron-on and patches are carded for a retail store display. Made in USA. mCOASTER - CALIFORNIA 66 plastic coaster or sign. 3.75" tall x 3.625" wide. Individually poly bagged with a hole to hang. Made in USA. poppies embroidered souvenir patch. 1.75". h37013 - Reindeer hat. Fits most kids & adults.